I have an irrational hatred for cleaning garlic. I hate the way the skin sticks to my fingers, I hate that I can smell the garlic on me for ages afterwards. I hate that all the cloves are different sizes. I also don’t like the taste of smell of the minced garlic in bottles, it never tastes quite right, like lemon juice out of a squeeze bottle. So, I’ve developed a few tips and tricks to avoid the hassle. Fresh garlic is always best, so if you can get it fresh and want a potent garlic flavour, go for the good stuff. If I’m doing a lamb roast, or a garlic centred dish, I always forgo the annoyances and get the fresh stuff. 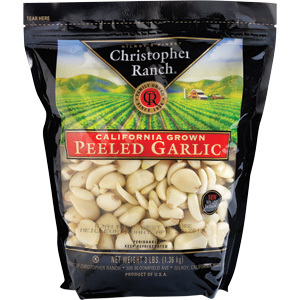 I buy these bags from Costco, but there’s a lot of places you can buy already peeled garlic. I then rinse and place the whole lot in a food processor and process until finely chopped (almost a paste). 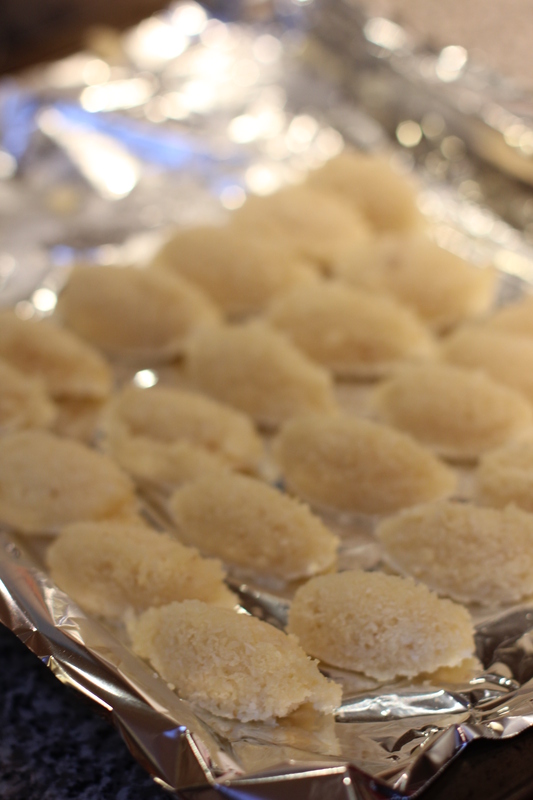 Next I place teaspoons full (about 2 small cloves of garlic) onto a tray, lined with paper and place in the freezer. Once frozen (leave at least 4-6 hours depending on your freezer) I place them in zip loc backs and keep in the freezer. When I need garlic in a recipe, I simply place a frozen nugget in the pot, it defrosts quickly and I have no garlic skins stuck to me! I also freeze some cloves whole by laying them on a tray and placing them in a Ziploc bag once frozen. This is for recipes that ask for slices or chopped garlic, rather than crushed. 1 bag of garlic lasts us at least a few months and a few hours work (mainly in the freezer) saves me a lot of annoyance down the track.